To be a kidney donor you must be over age 18 and in generally good health, physically and mentally. In order to donate directly to your intended recipient, you need to be blood type compatible. If you are not blood type compatible kidney paired donation may be an option. All potential donors are thoroughly evaluated medically and psychosocially prior to donation to ensure their safety and well-being. Sometimes donors cannot donate directly to their intended recipient because of blood type or immunological incompatibility. In this situation, an incompatible donor/recipient pair may choose to participate in a paired donation. 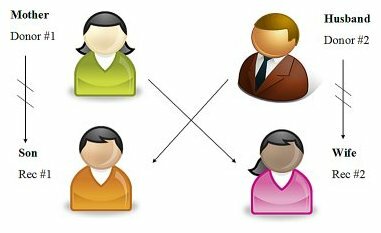 The incompatible pair will be matched with a donor/recipient pair in the same situation. The donor of the first pair donates to the recipient of the second pair, in exchange for the donor of the second pair donating to the recipient of the first pair. We have been performing living donor transplants at Virginia Mason for more than 25 years. At Virginia Mason, our surgeons specialize in laparoscopic nephrectomies. Donors recover and heal more quickly after this procedure than after traditional open nephrectomies. Most donors stay in the hospital for 2-3 days after surgery, and are fully recovered from their surgery after 6 weeks.